Pig and Goat are friends. Best friends. The kind of friends who are always together, who do everything together, and who know just what to do or say to help each other. If ever Pig feels small, Goat tells tall tales. If ever Goat can't sleep, Pig hums. They know they will always stick together, side by side. Until, one day, something changes for Goat. The peaceful orchard with Pig by his side is no longer enough. He wants adventure. Pig doesn't. But Goat and Pig are friends forever. They must always be side by side and stick together. So Pig reluctantly follows Goat up into the hills. While Goat loves the wind and the rocks, Pig misses the trees and the stream back in the orchard. Pig wants to go home; the hills are not the place for him. But how can Pig and Goat still be friends if they're not side by side? 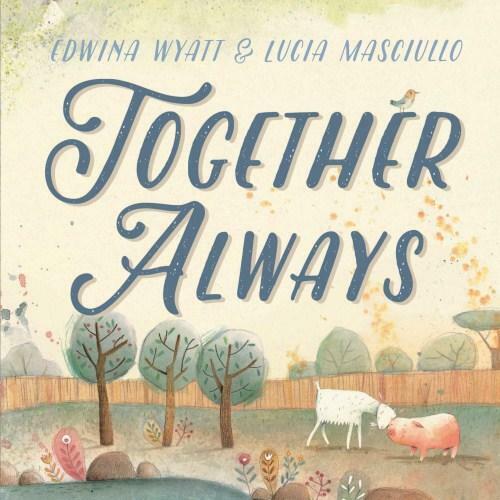 Edwina Wyatt's debut picture book was the gently perceptive In the Evening (see review here), which explored the friendship between introvert Oscar and extrovert Charlie. Together Always is further evidence of her ability to sensitively depict the ups and downs of friendship and the differing needs of different personalities. Lucia Masciullo's pencil and watercolour illustrations are a simply gorgeous accompaniment, capturing all the emotional nuances of Pig and Goat's relationship. As parents, our hearts break when we see our kids struggling with friendships. The friend they always did everything with now loves ballet while our child prefers hip hop. A new boy joins the class and suddenly the duo that was inseparable becomes a looser trio that doesn't feel as comfortable for one member. It's at times like these, when our children may feel a little vulnerable or uncertain, that books like Together Always can be so valuable. Sometimes we all need to be reminded that we don't always need to be 'side by side' for true friendship to endure.